To our community: Thank you for renewing our millage! Today is a great day at Henry Ford College! 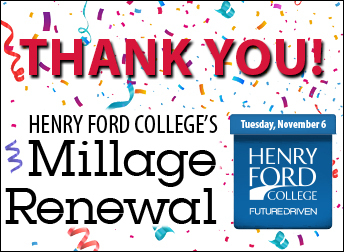 Thanks to you -- our community -- our millage renewal proposal was overwhelmingly approved in the November 6 election for an additional five years. I could not be more grateful for your unwavering commitment, support, and efforts to ensure the continued success of your community college: Henry Ford College. Wednesday morning reports indicated more than 70% in favor of the millage renewal, and 30% opposed (23,529 yes, 9,914 no). I am humbled and honored by the faith you have in this College, and by the way you showed that faith in renewing our millage. We strive every day to be worthy of your faith and support. I am grateful to the members of our Board of Trustees, our cabinet, and our staff for getting the word out about the College, our stewardship of public funds, and our value to this community. This millage would not have passed without their individual and collective efforts. 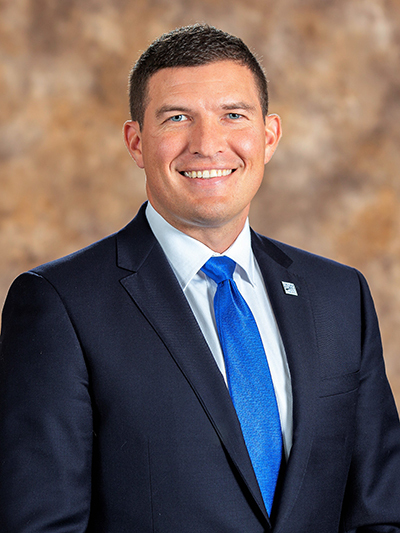 I want to acknowledge the hard work of John McDonald, the president of the HFC American Federation of Teachers, who chaired the millage advocacy campaign that was run independently of the College. The AFT as a whole was central to the success of the campaign. Lynn Boza, president of the Adjunct Faculty Organization, and the AFO members were also instrumental in this effort. Lori Gonko and her colleagues in Institutional Research & Planning, along with Marketing & Communications and the web team, created top-quality informational materials, mailings, and a website to share the facts about the importance of our millage. Dozens of individual members of Local 1650, Local 71, SSA, and Administrators selflessly dedicated their personal time to the millage renewal effort, and I am grateful to each of them. I also extend my heartfelt thanks to every person in our community who took it upon themselves to advocate individually for this important millage renewal. I know you worked hard for this, and you deserve to share in the celebration of our success. As this College moves into its next 80 years, I am looking forward to working with everyone who is dedicated to helping our students succeed in their careers and lives. As a sign of our commitment to transparency, we will continue to post information about the millage to our website (hfcc.edu/millage), so the public can review our commitment to being good stewards of our public funds. Your tax dollars, and mine, will always be hard at work at HFC, supporting student success. I am proud to be a part of our community and our College, and I am proud to be your partner in this mission of transforming lives and building better futures.